The Duluth Missabe & Iron Range Railroad was a iron ore hauling rail line, utilizing gigantic Yellowstone class articulated steam locomotives. The Duluth Missabe & Iron Range Railroad used huge articulated steam locomotives to haul the iron ore it moved to the Great Lakes. This mug features one of those Yellowstone class monsters. 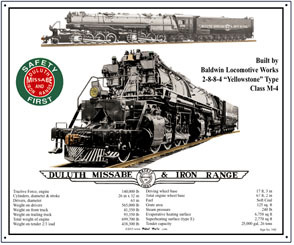 4 x 8 tin sign of the Duluth Missabe & Iron Range monster 2-8-8-4 articulated steam locomotive with builders specifications. 6 inch x 6 inch square tin logo sign of the Duluth Missabe and Iron Range Railroad. Mouse Pad featuring a monster Duluth Yellowstone Class articulated steam locomotive. Your mouse will move very fast on this monster pad! 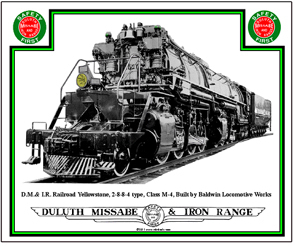 Tin sign featuring a monster Duluth, Missabe & Iron Range Yellowstone Class M-4, articulated 2-8-8-4 steam locomotive. One of these monsters is on display in Minnesota.